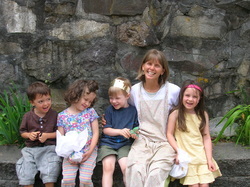 Sue Conlon (miss sue) is a Certified and experienced Waldorf teacher, with a MA in Education. Graduating from university in NC, with a BA to teach Shop in public schools, she went on to earn a MA in Early Childhood Education. She received her Waldorf Certification from Sunbridge College in Spring Valley, NY in 1989. Before her family moved to Portland in 2004, she was a middle gradeswoodwork and ceramics teacher at Hawthorne Valley School in rural NY. She has loved building Windsong! She has five daughters of her own ...nigh on grown. roan: miss sue, do you know how much i love you? miss sue: how much, roan? roan: as much as that pine tree out there has spikes. ezra: i love you as much as the common loon loves to swim. sahalie: I love you as much as our muffins are crumbly! Sue Conlon ("Miss Sue") is everyone's dream pre-school teacher and beyond. She is truly an angel and a precious gift to both children and parents. She brings incredible love, warmth, and magic to the children and the pre-school experience. My older daughter, now 14, considers Miss Sue the best teacher she has ever had. I would agree. Along with her kindness and compassion, she has served as an invaluable teacher to parents, providing guidance in parenting, self-care and the creative process through adult craft nights. Sue Conlon is truly the best!" "Miss Sue is one of the most sturdy, rock solid, creative, compassionate, gentle and kind teachers I have ever known. If Miss Sue has come along your path, as a potential teacher, you are blessed. She is an expert who can wisely guide the hearts and hands of young children, and old children too (like me)! I have seen her transform and integrate highly active little ones who have a hard time being in a group, as well with bully types. I always felt that my son was safe and cared for in a loving way in Miss Sue's classroom. As a bonus, She is also an amazing teacher of crafts to the parents. I just wish that I could be in her classroom of life. She is a treasure and gift to all that she knows." "Teacher Sue is one of those rare human beings that you know instantly is doing the work she is meant to, alongside children. 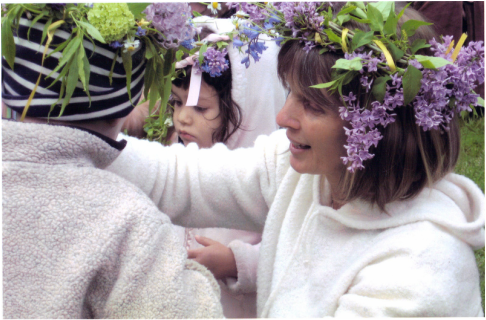 She creates calm, loving environments where kids feel at ease and can blossom. She is a remarkable crafts person, too, and creates beautiful environments for her students. We will forever be grateful our paths crossed and that our son had some time in her class." "Miss Sue's warmth of heart and care for children is exactly what I needed for both of my children, who were reluctant to leave my side. They didn't need much coaxing to join in the fun at Windsong, and soon they were (and still sometimes do at age 13 and 8) talking about moving in and living at Windsong with Miss Sue. The parent community of like-minded souls still nourishes me today many years later. Our time with Miss Sue was one of the most cherished times of our family's early years." "Miss Sue is a treasure. She brings warmth, play, song, yummy smells, wonder and most importantly, love, to the children in her class every single day. Years later, my girls still sing songs from Miss Sue as they go about their day. Picking Miss Sue as their first teacher is one of the top five best things I have done as a parent. If you have the opportunity to share your children with Miss Sue, you have struck gold."